Sturm, Ruger & Company, Inc. (NYSE-RGR) proudly announces three High Lady divisional wins from Team Ruger competitors Randi Rogers and Maggie Reese Voigt at this year's USPSA Henry's Cup and Safariland Expedition Championships. Rogers took High Lady in the production division at the USPSA Henry's Cup Championship held at Area 59 in Rosenberg, TX. She finished with a time of 275.55 shooting the Ruger American® Pistol chambered in 9mm Luger. "This was my first time shooting the Ruger American Pistol in competition and I loved it," said Rogers. "The gun was accurate and fun to shoot, even on the all-steel stage." 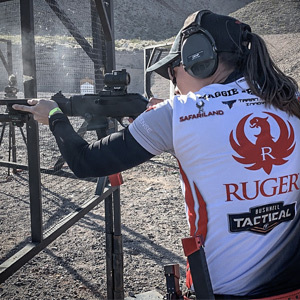 Newly-signed Maggie Reese Voigt made her Team Ruger debut with two back-to-back divisional wins at the Safariland Expedition UML Championship and Safariland Mike Voigt Memorial UPL Match held at the Pro Gun Club in Boulder City, NV. Competing with the Ruger® PC Carbine™, Reese Voigt claimed two High Lady spots in the Pistol Caliber Carbine (PCC) division with a final winning time of 858.78 for the Safariland Expedition UML match and 412.62 for the Mike Voigt Memorial UPL match. "This was my first match with the PC Carbine, so I really wanted to push the limits to see what the gun could handle," said Maggie. "Even through 37 stages, heat, cold, wind and dust, my rifle performed through it all. I am really proud of this win and excited for the year ahead with Ruger."